Perhaps you also may have heard that video games are leaving lasting impressions regarding the way we think about and treat women and minorities? Maybe you've never even thought about it. 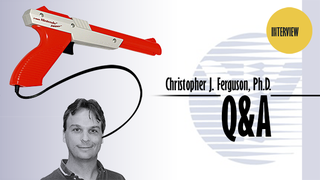 Dr. Christopher J. Ferguson is an associate professor at Stetson University, and is a widely published and well renown skeptic of video game produced violence. At this year's American Psychological Association Convention, he gave several talks regarding the state of video game content, how the media has fueled the scientific literature, and how the American Psychological Association (APA) should change their official stance on video game violence to: "APA: Wasting your time for a decade and a half". Gracious enough to take some questions, here are some elaborations on his sessions. Can you speak about the APA's official position on video game violence, and why you believe it is terrible? Christopher Ferguson: Well, on a very basic level it just doesn't accurately represent the science. It wasn't an accurate representation of the science back in 2005 and it's even worse now as more and more studies have come out indicating that video games are not related to aggression or certainly societal violence. In this sense the policy statement was a demonstration of "citation bias" in which the policy only cited studies supporting it and ignored studies that didn't (and also ignored already declining youth violence rates). That's probably not surprising though as...and this was the other major problem with it...the committee that wrote it consisted only of scholars invested heavily in anti-media theories who reviewed their own work and declared it beyond debate. No skeptical scholars were included in the panel. Having scholars review their own work isn't remotely objective and that the APA allows this demonstrates something fundamentally problematic with their policy statement process. That's why 230 scholars recently wrote an open letter to the APA asking them to retract their policy statements on media violence. My strong sense is that the Kotaku readership, as well as many young people in general, feel that video game violence does not affect their behavior. What – if anything – would you say to caution this perception? They are probably more right than wrong. My only advice really would be to examine the arguments that are out there and become real sophisticated in both identifying and noting the flaws in the bad science that often surfaces. I sometimes see that "I've played video games for 30 years and never killed anyone" comment and while I get the appeal of that, it's anecdotal. It's much more important to point to the falling youth violence rate or lack of correlational cross-nationally between video game consumption and violence, or to be able to note specific studies that find no effect, or to cite the 230 scholars' letter to the APA, or the Supreme Court case...and be able to discuss specific methodological weaknesses of studies, such as failure to match video games carefully on variables other than violence in experiments, the use of unstandardized aggression measures that let researchers pick and choose their outcomes, etc. It's a bit more wonky and requires some actual homework, but I've seen some young gamers do it even in discussions with parents. The most important thing, though, is to always debate respectfully. In one talk, you spoke of the field being split 58% in favor of a relationship between video games and aggression. Going forward, do you foresee that figure rising or falling? Well, that was just one figure from a range of estimates that range from 10.1% up to the 58%, so particularly if we're talking about the impact of games on societally relevant stuff like youth violence, probably about 30-40% of clinicians and scholars agree there may be effects...much less than some people had been claiming. That number does seem to be falling. For instance in the 1980's there was some data to suggest that 80% of scholars agreed television violence could impact societal aggression. So we're seeing a lot more scholarly skepticism than in previous decades. The media violence hypothesis just hasn't worked out the way some claimed it would, with some pretty dramatic claims linking media violence to everything up to mass shootings. Data to support those claims just never came to be, and I think folks have gradually realized that. That's not to say there isn't a debate among clinicians or scholars...30-40% is still a substantial minority and they may have some excellent points and should be welcomed into the debate...so long as they are able to be themselves respectful of scholars who disagree with them. I think that's been the biggest problem for our field, not that some people argue that violent games may have certain types of effects, but that some of those scholars have tried to stifle any discussion by calling themselves "true experts" and their opponents "denialists" and "industry apologists" and comparing their research rather absurdly to global warming and lung cancer research. That needs to be discouraged by scholars of all opinions. Let's discuss Moral Panic Theory, as several fellow researchers related it with video games this last week. This theory posits that morality is questioned when it especially profits scholars, politicians, and journalists. You already addressed the APA with issues you believe academics should address. Do you have suggestions for journalists? The issue for journalists is that both editors and many readers tend to be older adults who hate video games. So there's the perception that sensationalist headlines will result in page clicks and subscriptions, etc., and they're probably right. There have been some examples of news media professionals (Katie Couric comes to mind) who were shamed for sensationalist and one-sided coverage, but overall I imagine journalists may think the risks are smaller than for scholars. After all, everyone remembers Frederic Wertham totally screwed up comic book research, but no one remembers the journalists who promoted his claims. I think that calculus will change and is changing...more readers are young and pretty savvy about sensationalist claims. And a lot of journalists have gotten much better at getting at both sides of these debates. Still, the news media frenzy after Sandy Hook was like throwing chum in an ocean of sharks...and all of that proceeded based entirely on rumor, rumor which, in the official investigation report, proved to be false. Lanza was more interested in Dance, Dance Revolution than any shooter games. Blowing it on that epic scale would be humiliating to a scholar, yet news media just kind of rolls on to the next crisis. But for journalists who do want to cover the issue carefully, making sure to get skeptical scholars to comment is key to making sure both sides are represented. That's true also for press releases for individuals studies...there was recently a press release from Dartmouth that completely oversold the impact of a rather mediocre study of video game violence which truthfully showed very minimal effects. Of course journalists aren't trained in social science (usually at least) so having a scholar comment can help demonstrate the weaknesses of a study...or even if a scholarly press release is being dishonest as happens more often than you might think. You mentioned a dichotomy between academics and advocates, using Anita Sarkeesian as an example of an advocate. Can you elaborate on the difference? With scholars, we're all human too of course, so scholars even in the best of circumstances, aren't remotely 100% objective either. Scholars should do their best to try to represent data as best they can. Thus, I don't say there are NO studies linking video games to aggression, of course there are. But my perception of the field as a whole is that the argument for broad, general, predictable effects has not been made and it may be time to try something different. As scholars we're free to have our opinions on the data, but we shouldn't be free to pretend data doesn't exist. Where some scholars have done exactly that, they have begun to function as advocates not scientists. "The field of media effects is remarkably aggressive, particularly for a field that expresses concern about aggression." You also gave a talk on how the research on violence and video games has clouded the field in finding potential alternative effects on behavior. We obviously have the observations on sexist attitudes in games. Do we have the research? It's still very early yet. I'd like to see more research examining the representations of women in games. Here I will say I consider myself an advocate for more egalitarian and stronger presentations of females in games...I say I'm an advocate because I would like to see that despite not really having any data to suggest society will implode if this doesn't happen. My suspicions are that, were the research to be done, we'd find that effects are pretty small and probably quite nuanced. But I still think a cultural change here in games would be a good thing. You mentioned that you don't want everyone to be a skeptic like you. Why? As I mentioned one of the biggest mistakes this field of research made was to declare a kind of quasi-religious truth and then try to bully everyone into following it to the point of disparaging any scholars who didn't agree. The field of media effects is remarkably aggressive, particularly for a field that expresses concern about aggression. We need to open the field to dialogue, from scholars of all impressions. We know there's no consensus, one way or the other, so we need to find ways to speak, respectfully, to each other about our different ideas. Debates can be fun if we treat each other with respect and that's what's been lacking. So it would be a mistake for skeptics to shut out all causationists...and it would be a mistake for people who consider themselves "moderates" in the debate to declare themselves the truly objective people either if they stopped listening to people who were either causationists or skeptics. Finally, what games are you playing right now? Christopher J. Ferguson is an associate professor and department chair of psychology at Stetson University. He is a published researcher and journal editor on topics such as violent behavior and the positive and negative effects of playing violent video games, among others. In addition, Ferguson has edited Violent Crime: Clinical and Social Implications, and is the author of The Suicide Kings. Alan is a grad student studying the psychology of creativity in southern California. He holds more pride in his First Edition Charizard than his degree.